Elica Vafaie is the Staff Attorney & Program Manager of the National Security & Civil Rights Program at Advancing Justice- Asian Law Caucus. Elica works on legal services, litigation, policy advocacy and Know Your Rights education protecting the civil and immigrant rights of Middle Eastern, Muslim and South Asian communities. She was the Project Director of the One Nation Initiative at the California Community Foundation in Los Angeles where she managed the first philanthropic program in Southern California providing over $1.5 million in grants to Arab, Middle Eastern, Muslim, and South Asian nonprofit organizations advancing civic engagement, policy advocacy, litigation, and capacity building. Elica received her B.A. from UC Irvine and Sciences Po, Paris. 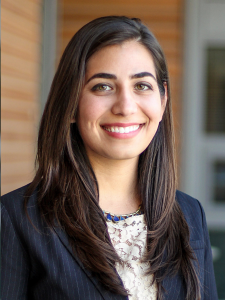 She received her J.D from UC Davis School of Law, where she was active in the Immigration Law Clinic, Middle Eastern South Asian Law Student Association, and was a UC Human Rights Fellow at the Center for Constitutional Rights. She is a 2015-2016 German Marshall Memorial Fellow.